Speaking for the FOTONNA Steering Committee, I want to say that we feel so very privileged and honored to be a small part of the Nassar family’s work in their pursuit of Peace with Justice through the projects at Tent of Nations. We are left in awe at the tireless work this family performs, and with each visiting tour, when Daoud gives so graciously of his time and energy, we are more and more humbled by his words and his actions. Because of our relationship, different members of our committee are able to take turns touring with Daoud on his semi-annual Educational/Fundraising Tours in the US. The icing on the cake for us is the opportunity to work with and meet so many generous and committed supporters of TON’s work during these tours. 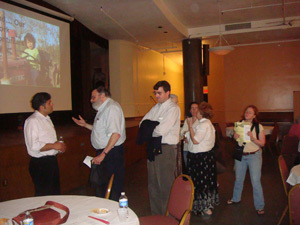 At more and more events, we are finding people who have visited the Holy Lands (and many who have visited TON) and are hungry for ways in which they can have a direct impact on the situation they find on the ground; their personal stories lend deep credibility to Daoud’s presentation. If you are interested in hosting Daoud for the Fall 2010 Tour, please let us know as soon as possible: November 1-20, 2010!! In addition to round-trip air miles between Amman, Jordan and DC, Daoud also spent about 2,500 + miles in a car and train plus air miles between DC and Raleigh, NC. He was on the road for so many hours we don’t even want to add them up! The worst part of the US trip was a three-hour ride from West Orange, NJ to Brooklyn, NY – just 20 miles. At least we didn’t have any official check points and didn’t have to prove our identity to anyone (glad we weren’t in Arizona). When he returned home on May 5, it took him almost seven hours to get from Amman to Bethlehem (just 50 miles). None of us can truly appreciate what he goes through with each trip here. Daoud spoke at 20 formal (and several more informal) events to over 1,000 people; he received a standing ovation in many places. 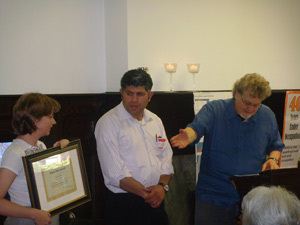 The Brooklyn Society for Ethical Culture awarded Daoud its 2010 Peace Award. There were several days in which Daoud made his presentation to more than one group but was able to keep his story lively and personal; even after so many ‘hearings’ for some of us we still listened to every word. Three farmers in the Rappahannock area in Virginia who grow organic fruits and vegetables and use natural methods for fertilizing and raising animals gave us a tour. Daoud was able to pick up some new ideas for implementing environmentally-sound practices on his own farm – very impressive people!! 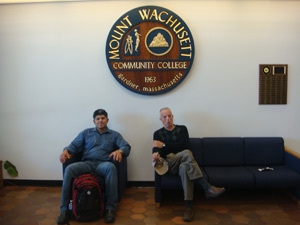 Daoud loves to speak to students – of all ages! 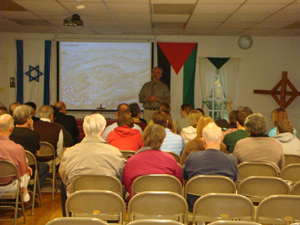 This time he spoke with: 5th – 8th grade students at St. Francis of Assisi Catholic School in Raleigh, NC; students at Rutgers University, New Brunswick Campus; Princeton Theological Seminary students; Wesley Foundation students and faculty in Williamsburg, VA; and, students and faculty with the Faculty for Israeli/Palestinian Peace (FFIPP) program in Gardner, MA. As we are all students in some sense of the word, I know every attendee learned something new from him. 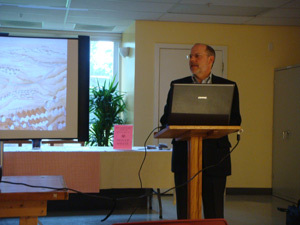 Besides visits to several local churches (Langley Hill Friends Meeting in McLean, VA; Trinity Episcopal Church in Little Washington, VA; St. Columba’s Church in DC; Episcopal Church of the Redeemer in Bethesda, MD), Daoud also presented at two house parties and the Presbyterian Middle East Concerns Team, talked with Congressman Connolly’s (VA) aide, and shared his story with Ash Jain and Ted Andrews at the State Department’s Policy and Planning Office. 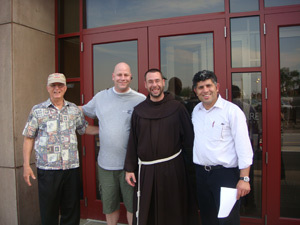 With support from Father Jacek of Holy Name College/St. 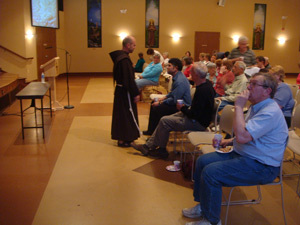 Camillus Catholic Church in Silver Spring, MD, Daoud was invited to speak at several other Franciscan Parishes (in addition to St. Camillus and St. Francis of Assisi). He shared his story at St. Patrick/St. Anthony in Hartford, Ct, St. Anthony Shrine and Ministry Center in Boston, MA, and at St. Mary’s Parish in Pompton Lakes, NJ. The friars (many of them had been on the land) added a true sense of joy and commitment and open-hearted support to all of us. They provided a special sense of hospitality as they shared meals and provided accommodations for us as we travelled between events. 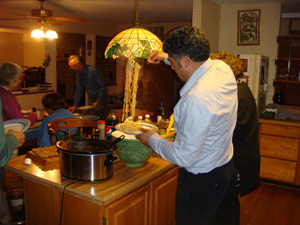 As mentioned earlier, we found people hungry to help – hungry to become part of the solution in whatever way possible. At Trinity Episcopal Church in Little Washington, VA, we had an immediate response from Daoud to the question: “What do you need right now that would be of help to you?” When Daoud said that a wine press would be good so they could process their grape harvest into grape juice and grape jelly, we received an email the next day with two choices of wine presses and the promise to purchase his first choice and get it delivered through a contact of theirs in Bethlehem. WOW!! That was impressive! When asked about marketing his products, one gentleman said he had contacts that would be of help – just let him know! Others said they would look into sponsoring a part-time cook’s apprentice so Jihan could have some help in the kitchen with food preparation for so many visitors and volunteers. We finally had to tell them to leave some of the projects for others to help with!! And, there are many other one-time projects from which to choose that when implemented will provide long-term self-sufficiency for the family. 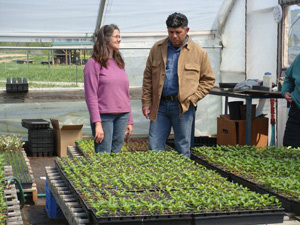 The goal is to help them reach that level of self-sufficiency. When they can make money from their ‘Peace Café’ and the sale of their own products, they won’t need help from us any longer. With the addition of four new cisterns (built with funds from FOTONNA supporters like you), sufficient water supplies are no longer the concern they were a year ago. With new tent covers (paid for with a grant from Trinity Presbyterian Church), they can provide more-than-adequate sleeping quarters for visitors and volunteers. With rent for the Women’s Education Center subsidized, they can expand their services to the women of Nahalin. With trees paid for, they can plant and plant and plant as many trees as needed for the future. How can you and your church/organization help? The following list has been provided by Daoud. If you can sponsor one of these one-time projects, it would be so helpful to them. If the price seems beyond your group’s reach, remember that others can pick up the balance. See which project your group would like to support then let Kay Plitt (kayplitt@comcast.net) know your first choice and the amount you can commit. We will have this list on the FOTONNA website (www.fotonna.org), and as projects are chosen and a specific amount is committed, we will update the list weekly and you can follow the progress made. If a project your group has chosen becomes fully funded, we will let you know and ask for a second choice. I do want to remind all of you that the Nassar family has been charged with over $150,000 in legal fees in order to fight the battle still going on in the courts today. If they could build on their own property; if they could get access to clean water and electricity; if they could get their produce to market; if they had clear access to their own road leading to the farm; if they weren’t being harassed by the military and settlers; if they could do lots of other things we all take for granted every day in this country – they wouldn’t need this financial support. But all of those ‘ifs’ are in place – no question about it. As Daoud says, “Where there is a will, there is a way.” We salute you for wanting to be part of that ‘way’ and thank you all for your spirit of support! 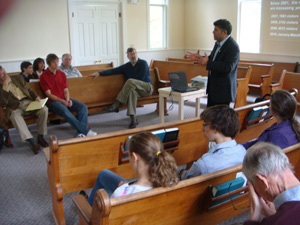 Since Daoud’s first tour to the States in November 2007, he has visited and spoken at over 100 venues, 40 of them churches. If each church that has heard his message took on a commitment of $500-$1000 for this one-time request, we would have more than enough to establish all of the above projects and maintain them into the next 3-5 years. If each individual who has heard his story could commit to $50 a year, the ongoing TON projects (summer camps, playground, women’s education center, etc.) could be fully funded on an ongoing basis. Please give this some thought!! Let’s see: On an annual basis, $50 (more or less) = 12 bags of chips – 1 dinner out for two – 4 movie passes or 10 boxes of popcorn – 10 McD meals – 15 ice cream cones – a ‘really good’ bottle of wine – 2 trips to the hairdresser – 3 trips to the barber – and on and on. What expense of yours are you willing to match for TON? And, remember: For a $50 donation (one time only), you will receive the booklet of poetry, “Where I Am From…” I am pleased to say that we have mailed out or given as gifts about 150 copies so far (for donations from November 2009 through today and for sponsoring events). 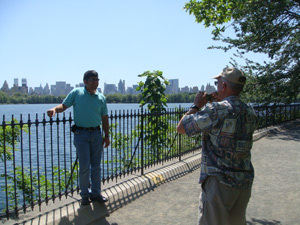 Here are a few pictures taken along the way on this Sixth Tour of the United States – April-May 2010.
and a few of these!? Bill Mims and Langley Hill Friends Meeting; Beverly Hunter, Paula and Todd Endo, Sharon Kilpatrick, Rev. Jenks and Trinity Episcopal Church; CSA farmers Cliff Miller, Nick Lapham and Rachel Bynum; Ann Loikow and St. Columba’s Church; Fr. Jacek and Holy Name College/St. Camillus; Mary Kay Turner and Todd Deatherage; Nadia Itraish and Sarah Eggleston; Steve and Marie France and Episcopal Church of the Redeemer; Fr. David McBriar and Dana Baumann and St. Francis of Assisi; Rich and Sudie Watkins; David Hindman and Wesley Foundation; Rev. 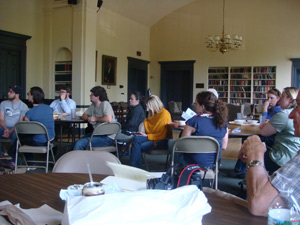 Barbara Heck and Rutgers University; Chip Dobbs-Allsopp and Gordon Mikoski and Princeton Theological Seminary; Fiona Boneham and Daniel Brooks, Abby Sher and Greg Tewksbury, and Sara Katz and Brooklyn Society for Ethical Culture; Br. Erick and St. Patrick/St. 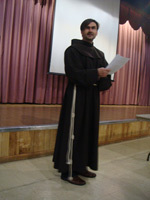 Anthony Catholic Church; Fr. Hugh and Jackie Stewart and St. Anthony Shrine; Yoav Elinevsky and FFIPP; Br. Larry and St. Mary’s Parish. Next: Daoud and Jihan have included their reports for you. Hello from windy Daher’s Vineyard. Just recently more olive trees were planted by a German group. The farm is always growing! Here is a short update on our situation, what has been going on over the last few months and what our plans are for the future. The political situation is getting more difficult; settlements in the West Bank and East Jerusalem are on a daily expansion. More Land is being confiscated for settlements, for settler’s roads and, of course, for the wall. Many villages, east, south and west of Bethlehem are becoming isolated like small islands and are disconnected from the city of Bethlehem because of the wall and the roads. As always, access to the Tent of Nations and the surrounded villages is limited. A new tunnel by Al Khadr under Road 60 to Hebron is almost completed. Soon we will only be able to use this tunnel to reach the villages and the Tent of Nations farm on the other side of Bethlehem. At this point we still have access to Bethlehem but we don’t know for how long. We have not yet been completely alienated, but the farm is always preparing for independent living and self sustainablity. We are preparing ourselves for the worst but at the same time hope for the best. We are still in the course of re-registering the land again as demanded; however, the process is being made very difficult for us and the prediction of our lawyer is that it is likely to take several more years. Our lawyer continues to peruse our case, but the Israelis insist that our land case is a difficult one; more time is needed to study it. This is hard to understand because they have already recognized our ownership of the land; we only need to re-register it again. At the same time this process is going to increase our financial burden. We would like to ask you to stay involved and watch out for any time in which we may need international support to voice your solidarity. Any financial contribution for legal fees is needed and will be appreciated. The financial burden is a way to put more pressure on us in order to give up but with your solidarity and support we are staying on our land. During the winter we planted 1,300 trees: almond, apple, grape, figs, olives and pine trees. Now there are thousands of different trees growing on the farm. We are contiunally cultivating the land towards the valley, planting it with more trees and making it green. Our aim every year is to cultivate more fields and plant them with trees; we welcome people to sponsor trees to be planted to protect the environment, to protect the land from being confiscated and keep it green. Green is the color of hope. The farm is becoming more productive, and planting more trees is an aim for the Tent of Nations to be self sufficient. For our animals we renovated new caves. Our goats and hens now have caves instead of coups or houses. We were not allowed to construct dwellings for our animals so we used the natural caves on the land to house them. As mentioned above, we must look ahead and prepare for the worst while hoping for the best. 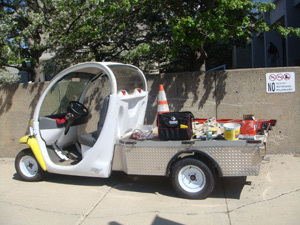 Our vision is to become as self-sufficient as possible, especially regarding energy and water. We have recently made some important new steps to make this vision a reality. The farm is now completely wireless. Voluteers can bring their computers and not only have access to electricity with our wonderful solar panels but also access to the internet with the solar power system that produces 4.5 KW of electricity. This is a misnamed section because as you know we are not allowed to build on the land. There are many new caves. though. As mentioned above, we now have caves for the animals. We also have a new cave for large groups and meetings; it can hold fifty people. We have always had the tents for summer volunteers and visitor groups, but this year we have new tents. We closed the area behind the volunteer rooms to be used as new kitchen and a Gift Shop. In our region, water is a contiunal concern and always limited. As you know, we are not allowed to have an access to running water, but we are trying to solve this problem with building cisterns. In the year 2009 we managed to build four cisterns, and the farm now has eight cisterns that can hold 605 cubic meters of water. We want to thank all people who helped and supported this project. Our goal is to raise the amount of water from 605 to 1000 cubic meters by constructing new cisterns in the next years. We also have now three compost toilets. They are clean and most comfortable to use. Although we are striving to conserve water and make ourselves sustainable we still have to buy water sometimes. Anything you can contribute for water is greatly appreciated. Currently the Bent Al Reef Women’s Week is underway. From April 12th to April 17th women from the village gather with international women to discuss and learn from each other. This year the theme is “Live in ways that are deeply fulfilling and at the same time socially and environmentally responsible.” Women are discusing personal development and confidence building, and also how to move towards a healthy environment and society. It is a wonderful opportunity for both the Palestinian women and the international volunteers. They are both learning a lot about each other and their cultures. If you are interested in supporting this with your time or funds please do not hesitate to contact us. We are always looking for future presenters and volunteers. Right now there are currently two long-term volunteers from Germany and seven more others from different countries. In the summer there will be many short-term volunteers to work with the summer camp and with the harvests. There are also some volunteers staying on the farm for the Women’s Week and working on the land. Since January to March there were over 700 visitors from many countries. More guests are expected to come to visit within the next months. This has greatly exceeded our expectations and we continue to welcome visitors. You know you are always welcome here. Of course we are preparing for our annual summer camps for local children. 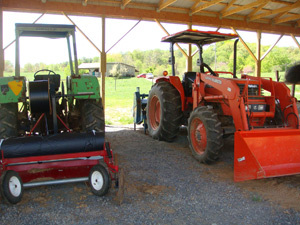 As noted above the farm is being readied for many summer volunteers. We are also in the process of creating a Peace Cafe. We still need to establish a place and buy all the necessary equipments and stuff. 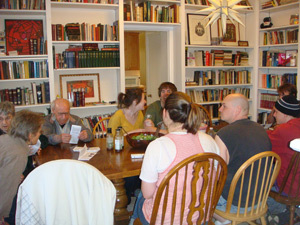 The idea is to invite people once a month for a talk and exchange of ideas and sharing experiences. It will be a chance for local people and volunteers to come together and share their hopes for a brighter future. We hope evenutually to offer vocational training to local people. There is a great lack of jobs here, and where there are no jobs there is little hope. This training will make those who participate more marketable and give them skills for local employment and future prospects. If you would like more information about Tent of Nations or if you would like to plan a visit please visit our web site, www.tentofnations.org or e-mail us at info@tentofnations.org. We are always happy to hear from you. For more information about our summer camps and harvest work camps you are welcome to visit our website. Finally, we would like to thank you for your continuing support and hope that you are enjoying a peaceful and rejuvenating spring. Art therapy is a form of counseling used with people of all ages. In an art therapy session, a patient will use art-making as a way of identifying feelings and expressing the things that are foremost in their minds. Children who have experienced a traumatic event can use art therapy as a way of sorting through their feelings and coping with the trauma.It can help children work through the difficult feelings associated with traumatic events, and eventually move beyond the trauma to live positive lives again.It helps children begin to cope with the violence, fear and sadness that are all too prevalent in their homes and neighborhoods. It can improve their quality of life and help them achieve their highest learning potential. “Raising a Healthy Happy Child “Parents and guardians are key decision-makers when it comes to the nutrition, physical activity and health needs of their child. Each day, you can take advantage of the healthy choices around you and do little things that can affect your child’s health in a big way. Toward a Healthy Society “Compassion and Non-Violence as Foundation for Daily Life”The way in which we communicate through our words and actions affect those around us and ourselves. By choosing to respond out of compassion and non-violence, we can change and even diffuse tension and anxiety around us. This workshop will begin to explore ways to express our experiences, needs and opinions while honoring the dignity and value of ourselves and the other. The clinical diagnosis and treatment in Traditional Chinese Medicine are mainly based on the yin-yang and five elements theories. These theories apply the phenomena and laws of nature to the study of the physiological activities and pathological changes of the human body and its interrelationships. The typical TCM therapies include acupuncture, herbal medicine, and qigongexercises. With acupuncture, treatment is accomplished by stimulating certain areas of the external body. Herbal medicine acts on zang-fu organs internally, while qigong tries to restore the orderly information flow inside the network through the regulation of Qi. These therapies appear very different in approach yet they all share the same underlying sets of assumptions and insights in the nature of the human body and its place in the universe. Some scientists describe the treatment of diseases through herbal medication,acupuncture, and qigong as an “information therapy”.